Why are fluids indicated in inferior wall MI? Inferior wall MI is associated with severe hypotension. So first, correct the hypotension, then, thrombolyse. Yes, but any reason for the hypotension? Because inferior wall has vagal plexus. Patients with inferior wall MI are parasympathetic i.e. high vagal tone. Can someone please give me regions of referred pain areas? Eg. Pain in the shoulder could infer problem with diaphragm. Left shoulder and ulnar border of left arm and hand - myocardial infarction. Knee pain can refer to hip. Renal colic pain is referred to the back. What is Kehr's sign please? Splenic rupture or hemorrhage irritates the diaphragm on left side and that refer s the pain to the left shoulder. Same like cholecystitis on right side. Why ECCE is not done when zonules are not intact? Because the IOL will be implanted in the remaining posterior capsule - And if the zonule is not intact, it may cause lens subluxation. In cystogastrotomy, as surgical treatment for pseudo pancreatic cyst...Why do food particles don't enter from stomach to pseudocyst through the communication? This question asked by surgical professor in OT today. Because cyst will be always in positive pressure and clinical studies show that the cyst rapidly decompresses. Approximating the mucosa with cyst wall, which has no epithelial lining, leads to rapid shrinkage of stoma. Within few days, neither the stoma nor the cyst is evident on radiology or endoscopy. As you all know, I am doing internship or housejob and it's really tiring but a good learning experience. Lemme share what I learnt / revised today! In my medicine OPD, we start most newly diagnosed hypertensive patients on amlodipine, a calcium channel blocker. Many of the patients, after a few weeks of therapy, come back complaining of lower extremity edema. You check their electrolytes, LFT's and RFT's and they are all normal. Hi. I keep forgetting that Conn's syndrome is hyperaldosteronism. Can you help me out with this? 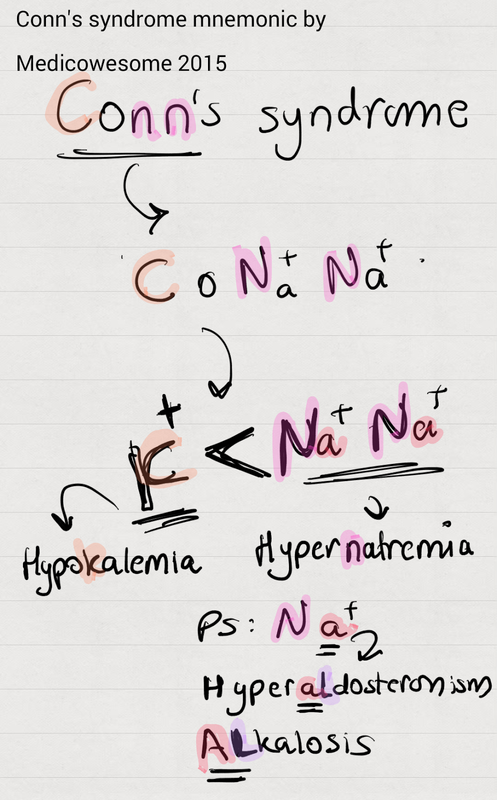 The N's are for sodium - Hypernatremia! The C makes a K for potassium, which is less than the number of N's, therefore, hypokalemia! Also, Na+ is sodium. A could remind you of Aldosterone. AL could remind you of ALkalosis. Which books do I study from while in second year MBBS? One of my readers asked to write a books recommendation posts for second year and here it is! Something I learnt from my first year - You should never be hasty in buying books. Medical textbooks are pretty damn expensive and you don't wanna be stuck with a book you don't like for the rest of the year. So here's what I recommend - Be "bookless" for the intial few weeks. Don't buy any books. Pretend you're broke and rely only on the library. Ask - Friends, seniors, book sellers, internet about books they think you should buy. Immediate seniors will be the best resource - Ask them why you should go for one book and not the other, know their reasons. You should be able to cut the long list of 10-12 books and bring it down to 2-3 books. In the bookless period, go to your library (Or use ebooks), read a few topics (Not just one!) from the two to three books you think you should buy. You'll like one and that's the book you should read for the rest of the year! Don't judge a book by it's initial few pages. You have to read topics of substance, big topics not the small ones. Example, don't read about Louis Pasteur and see which book wrote it better. Read about Staphylococcus or ELISA. K. D. Tripathi or KDT: It's a good book. It'll stick with you throughout the year! Katzung: Now this book is HUGE. It's fun to read! How to study: Get it from a library or use a PDF. Read the topics you like. I read diuretics from this book and boy I enjoyed it. It's too much to read so when exams near, you'll lose the book and run back to Tripathy. So keep in mind that this is not THE book and you won't be able to finish it or come back to it later. Take points and put it in your Tripathi in the first read itself. Lippincott: It is simple and preferred by a lot of international readers. Pappa Robbins or the big Robbins: It's awesome. How to study: It's a huge book, so do the "Important" topics from here first. Important? Yeah, the stuff that's been asked a lot of times in the previous papers. Try to do general pathology, CVS, RS and renal from this book. Baby Robbins or the small Robbins: It's useless. Harshmohan: It has lots of diagrams and point wise notes. You know who likes diagrams and point wise answers? Teachers. Ananthanarayan: It's just the right amount of information. If you study this one well, you won't require any other book. How to study: You wanna know how an organism looks like and what diseases it causes. Do cultural characteristics too. General microbiology - Read the important stuff. If you don't enjoy immunology while reading it, you're doing it wrong. It's my favorite subject! Imagine, read comics. Any book will do: I studied from Arora. How to study: Diagrams are key. If you can draw the life cycle, half your work is done. Diagnosis and treatment is simple. PS: If you are thinking of preparing for USMLE but are not too sure (Because second year is too early to decide your future xD), finish off the Kaplan videos, notes and Goljan audio. Ask me whatever you like in the comments section below! It's interesting how various clinical complaints like erectile dysfunction, hepatomegaly, diabetes, joint pain can be hints to a condition related to iron metabolism! Here's the game.. And below are the answers! Here's the link to the game if you haven't solved it yet! Clostridium difficile is the most common cause of antibiotic associated diarrhea. "Difficile grows when the normal flora are deficient." Antibiotic associated diarrhea is treated with metronidazole. "Definitely treat difficile with metrodiffizole." Does dopamine cause vasoconstriction or vasodilation? 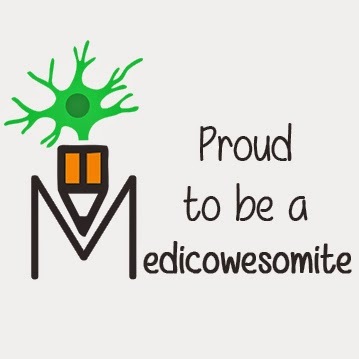 Is dopamine a vasoconstrictor or a vasodilator? Both! It depends on the rate of infusion. At low rates of infusion (0.5 to 2 mcg/kg/min), dopamine causes vasodilation that is presumed to be due to a specific agonist action on dopamine receptors in the renal, mesenteric, coronary and intracerebral vascular beds. At higher rates of infusion (10-20 mcg/kg/min), there is some effect on alpha- adrenoceptors, with consequent vasoconstrictor effects and a rise in blood pressure. The vasoconstrictor effects are first seen in the skeletal muscle vascular beds, but with increasing doses, they are also evident in the renal and mesenteric vessels. And it's back again! Except, it is more tougher conceptually. 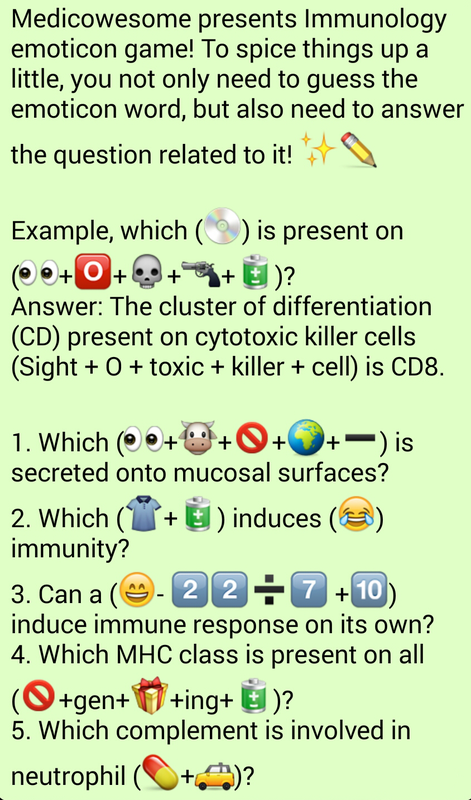 We figured guessing words out of emoticons is too lame and easy for you medicos and thought we'd add questions to make it more fun! We did a massive change in all 4 groups, we clubbed Asians in two groups and Non Asians in two groups. Now the groups are segregated time zone wise, leading to better fruitful discussions! Though we do a bit of a mix and match here and there. Also, we recently made group 5. It's a lot of discussions to take it for people who are in all 5 groups! How does food relieve pain in duodenal ulcer and aggravate pain in stomach ulcer? Food reaching stomach causes acid secretion. Therefore, pain increases.